Canine Health Concern Vaccine Survey was conducted in the 1990s and involved 3,800 dogs. Our findings were astonishing, and confirmed that there is a high likelihood of your dog becoming ill within three months of a vaccine event. The survey was published in What Vets Don’t Tell You About Vaccines. The study is now closed – we are NOT looking for further dogs to participate. The homoeopathic vet Christopher Day told us that he suspected that around 80% of the diseases he treats in his practice are vaccine related, and occur within three months of vaccine event where the start date of the illness is known. Chris is a referral vet, which means that he tends to see mostly the cases where every other avenue has been tried and failed, so the 80% figure was, by his own admission, likely to be exaggerated. We put Christopher Day’s hypothesis to scientific test. The CHC vaccine survey was first launched during October 1996. A questionnaire was devised by John Watt – a statistician with a Masters in statistical analysis and operational research – with the help of Christopher Day, Jean Dodds DVM, and Dr Viera Scheibner. Some 30,000 readers of Dog World magazine were invited to participate. In addition, all members of Canine Health Concern were mailed with a questionnaire, and some members of CHC (very kindly) circulated the questionnaire to friends and neighbours. 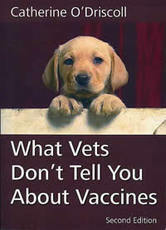 At time of publication of the second edition of my book, What Vets Don’t Tell You About Vaccines, 770 detailed questionnaires had been received. These covered 523 dog owners and a total of approximately 3,800 dogs. This enabled us to compare the first interim results with a larger database. For the purposes of this survey, we asked all participants to list their dogs’ illnesses, and tell us how soon they started after the date of vaccination. Our aim was to test whether there was a time frame bias between vaccination and the start of illness. This in itself would enable us to see whether illnesses which developed within three months after vaccination might be vaccine-linked. The hypothesis is that, if vaccination has no adverse effect or even bearing on subsequent illness, then illnesses will occur in equal numbers at any time during the twelve months after vaccination. In fact, the results show a distinct skew or bias towards illness occurring within the first three months after vaccination. No data was recorded in respect of lupus, Lyme disease or rabies in the first analysis, but one dog with lupus was incorporated into the second analysis. Obviously, no statistical conclusions can be drawn on such a sample size. Some diseases showed a distinct bias towards occurring at nine months or more after vaccination had taken place. These are arthritis and heart conditions. We do, though, ask why these illnesses should all be clustered together at around the nine month period? It may, in fact, suggest that it takes longer for these illnesses to manifest overt symptoms, and consequently for diagnosis to take place. If vaccination had no bearing, then there should by rights be an even spread of occurrence throughout the twelve month period. In a paper published in the Journal of Veterinary Internal Medicine, Vol 10, No 5, September/October 1966, entitled ‘Vaccine-Associated Immune-mediated Haemolytic Anaemia in the Dog’, the authors state: “Because vaccine components can remain in the body for extended periods of time, chemical reactions caused by these vaccine components may continue to occur later than with other drugs that are excreted or metabolized more quickly.” This statement in its own right would appear to support the belief that vaccines can cause reactions some time after the jab. The first, astounding, finding of our initial survey results showed that, overall, 55% of all illnesses reported by participants occurred within the first three months of vaccination. This rose to 66% in the second analysis. If the vaccine had no bearing on the illness, you would expect to see no more than 25% occurring within that three month time frame. The original observation was tested using a standard t-Test which resulted in a t value of 5.39 with alpha at 0.001%. This means that a statistician would be 99.999% confident that vaccines are related to the subsequent illnesses. In respect of the illnesses occurring seven days after vaccination, the case against vaccination is even more dramatic. The first interim survey results showed that 24.56% of illness occurred within seven days, when statistically it should only be 1.92%. This rose to 29% when more dogs were added to the survey. That is to say, the risk of illness is 12.8 (now 13%) times greater than would be expected if vaccines had nothing to do with the illness. This t-Test gave a t value of 4.69, with alpha at 1%. For the non-statistician, this means that the vaccine/illness connection can be expressed with 99% confidence. 66% of illness occurring during this period compared with a maximum expectation of 25%: almost three times the number of illnesses you would expect if vaccines had no bearing on the outcome. Specific diseases highlighted by the first interim survey now follow. 2.7% of all dogs surveyed had arthritis. Of these, 71.8% were diagnosed nine months plus after vaccination. Arthritis in humans has been positively linked to vaccines. The fact that the onset of arthritis clusters at the nine month period indicates that vaccine-induced arthritis has a longer incubation period, or takes longer for overt physical symptoms to manifest. At a 95% confidence interval, we believe that arthritis is caused by vaccination. The New England Journal of Medicine (vol. 313 no 18, 1985), carried a research report entitled ‘Persistent rubella virus infection associated with chronic arthritis in children’. The report confirms that infection or immunisation with rubella virus has been recognised in producing an acute synovitis (inflammation of the joint) . . . which has been reported to recur in certain persons for months or years after the acute stage’. It is also reported that it is often possible to isolate the virus from affected joints in children, vaccinated against rubella, many months after the vaccination. Arthritis can be either inflammatory or noninflammatory. Stratton Vaccines: 97 carries case reports linking tetanus and diphtheria vaccines with arthritis and skin eruptions. The US National Academy of Sciences IOM report concluded that the measles vaccine can cause death from measles-vaccine-strain infection, thrombocytopenia, fatal shock and arthritis. Measles and distemper are, as you know, virtually the same virus. Transient arthritis follows rubella vaccination (Am J Child Dis, 1969), and pain in wrists, hands and knees (JAMA, 1970). One study reported that as many as 26% of children receiving rubella vaccination develop arthritis (Science, 1977). A study by the Institutes of Medicine in America concluded that there was evidence of a causal relationship between the rubella vaccine and acute arthritis in 13-15% of adult women. As arthritis has been clearly linked to a number of different vaccines, it would be blinkered to discount the possibility that canine vaccines can also cause arthritis in the light of these survey findings. Where dogs had diarrhoea, 68% of cases occurred within the first three months following vaccination. Where dogs had allergies, 55.6% started within the first three months after vaccination. 3.8% of dogs surveyed had allergies. This indicates that vaccines do, indeed, ‘sensitise’ an organism. At 99% confidence, we are certain that allergies are triggered by vaccines. Of course, Merck has already told us that patients suffering from B and T cell immunodeficiencies should not receive live virus vaccines. Deficiency symptoms include atopic (inherited) diseases such as allergies. Dr Robert Gouch of Baylor University, Houston, Texas reported to the US Public Health Committee in 1982 that a worsening of allergic symptoms occurred in six out of seven people immunised against flu. It wouldn’t take too great a leap of imagination to understand that other vaccines can provoke hypersensitivity reactions and could quite easily invoke or worsen allergic conditions. Frick and Brooks, in 1983, demonstrated that vaccines can trigger atopic dermatitis. As over half the dogs in the CHC survey first became allergic within three months of vaccination, we strongly suggest that further research be conducted to establish the relationship between vaccines and allergic conditions. This research, rather than being based upon experiment, could be simply accomplished if vets or the Veterinary Medicines Directorate took a serious look at patient records. At 95% confidence, it is very probable that ataxia (muscle incoordination caused by lesions throughout the nervous system) is caused by vaccines, with a high percentage starting within three months of vaccination. Merck has already told us that encephalitis can extend to the central nervous system, and encephalitis can result in lesions. 54.8% of dogs in the survey with autoimmune diseases developed this condition within the first three months after vaccination. However, there were abnormally low incidences occurring at the six month and nine month intervals, which may be explained by delays in diagnosis. We can now say that AI related diseases, at a 95% confidence interval, are vaccine-related. Merck acknowledges that autoimmune disease can follow rabies vaccination in which, ‘cross-reaction probably is initiated by animal brain tissue in the vaccine’. As dogs in the UK are not yet subjected to the rabies vaccine, we must either assume (upon the evidence that nearly half of dogs in the survey with autoimmune disease developed it within three months of vaccination) that either other canine vaccines are developed on brain tissue, or that vaccines not cultured on brain tissue can also initiate autoimmune diseases. Merck tells us that details of the autoimmune response are incompletely understood. We do, though, know from other research that autoimmune haemolytic anaemia, Hashimotos thyroiditis, cancer, leukaemia, atopic dermatitis, and other autoimmune diseases are positively associated with vaccination. Where dogs had colitis, 56.9% occurred within the first three months after vaccination. 2.7% of dogs surveyed had colitis. This finding may help current research seeking to establish the vaccine/colitis/irritable bowel link in humans. At 95% confidence, the survey indicates strongly that colitis is a sequel to vaccination. As colitis and diarrhoea overlap, the case could be considered to be even stronger. The Concise Oxford Veterinary Dictionary defines colitis as inflammation of the colon and says it is also associated with concurrent enteritis, which it defines as an acute or chronic inflammation of the mucosa of any part of the intestines. Crohn’s disease, an inflammatory bowel disease which can affect any part of the digestive tract in humans, has been associated with vaccination by Dr Andrew Wakefield of the Royal Free Hospital in London (The Lancet Vol 345, 1995). Where dogs had dry eye or conjunctivitis, 56.9% occurred within the first three months after vaccination. 2.5% of dogs surveyed had this complaint. According to the homoeopathic vet Richard Pitcairn, the vaccine has induced chronic (long lasting) conjunctivitis, rather than distemper-induced conjunctivitis. At 99% confidence, we are certain that dry eye and conjunctivitis can be caused by vaccines. Frick and Brooks’ research highlighting the incidence of atopic dermatitis following vaccination showed that conjunctivitis could also be involved. Conjunctivitis is described as a Type 1 hypersensitivity reaction in the Concise Oxford Veterinary Dictionary. Where dogs had epilepsy, 65.5% occurred within the first three months following vaccination. 2.1% of the dogs surveyed had epilepsy. Epilepsy is essentially a neurological condition; scientific evidence has already been given to explain that vaccines can cause brain palsy and lesions, leading to epilepsy (this is tied in with encephalitis, admitted by vaccine manufacturers to be a possible effect of vaccination). The surveys allows a 99% certainty that epilepsy can be caused by vaccines, and that the most common cause of epilepsy in dogs is vaccines. Where dogs showed nasal discharges, 84.1% occurred within 3 months of vaccination. 1.7% of dogs surveyed had nasal discharges. At 99% confidence interval, it is a certainty that nasal discharges are vaccine related. Indeed, as Dr Richard Pitcairn has stated, “a dog with distemper would have watery discharge of eyes and nose; a dog with chronic vaccine-induced distemper would have a tendency for watery fluid to drip from the nose”. Where dogs exhibited a nervous or worrying disposition, 54.8% began to do so within three months post-vaccination. 2.8% of dogs surveyed suffered from this complaint. This is THE certainty of the survey! It has the highest t-score of any group, i.e., 19.9. Combined with another category – behavioural problems – we can say without a shadow of a doubt that vaccines cause personality changes in dogs. Of course, we know that encephalitis can be caused by vaccines. This fact is irrefutable. Where dogs had skin problems, 46.2% started within three months after vaccination. 5.4% of dogs surveyed had skin problems. This, again, supports the contention that vaccines sensitise an organism. Again, with a 99% confidence, we can be certain that vaccines cause skin problems. Research conducted by Frick and Brooks in 1983 illustrates graphically that skin problems can be induced by vaccines. Where owners reported vomiting in their dogs, 72.5% occurred within 3 months of vaccination. 3% of dogs surveyed were reported to have vomited. This, of course, can be described as an anaphylactic reaction which can develop into encephalitis. Dr JA Morris, a leading US infectious disease expert declared: “We only hear about the encephalitis and the deaths, but there is an entire spectrum between fever and death, and it’s all those things in between that never get reported”. Vomiting after vaccination can be expressed as a vaccine reaction, as a certainty at the 95% confidence interval. Where owners reported weight loss in their dogs, 63.1% were within three months after vaccination. 2.5% of dogs in the survey had lost weight. At 99% confidence, weight loss is directly connected to vaccination. The legal firm Dawbarns has been acting on behalf of parents whose children were vaccine damaged. Their fact sheet describes vaccine-induced Crohn’s disease which, it says, ‘can also be accompanied by joint pains and swelling, and conjunctivitis of the eyes. It can take many years to develop, but with children the first symptom is often malabsorption and failure to thrive’. Where owners reported behavioural problems, 55.4% occurred within three months after vaccination. 2.5% of all dogs surveyed had behavioural problems. This, then, supports Dr Harris L Coulter‘s hypothesis that much human violence, sociopathy and criminality is vaccine linked, and has its basis in brain damage caused by vaccines. At a 99% confidence interval, we are now certain that behavioural problems are largely vaccine related. Where dogs had tumours or growths at vaccination site, 67.9% occurred within three months of vaccination. 1.1% of all dogs surveyed suffered from this occurrence. It is well recorded in the medical/veterinary literature that cancer/tumours can (and do) grow at vaccine sites. With 95% confidence, we are certain that tumours or growths at vaccination sites are caused by the vaccination process itself. All of the above figures had z alpha scores of greater than 5, and showed a distinct tendency to occur during the first three months after vaccination. This means that there is a link between vaccines and the above illnesses which, in turn, means that the vaccine/illness link is a certainty. With the exception of distemper and leptospirosis, where not enough dogs with the disease were recorded, all of the above satisfy a z alpha score of more than three. This means that we are 99.53% certain that there is a strong causal link between vaccination and the onset of the diseases. In all cases, at least half of the dogs with each of the viral diseases contracted them within three months of vaccination. This supports the view that vaccines either don’t protect, or can cause the disease itself. Although we neededore dog owners to participate in the survey, we are able to make tentative prognoses regarding the likelihood of a vaccine reaction in an individual dog. One veterinary vaccine manufacturer claimed that 15 adverse reactions occurred in three million administered doses (.000005 probability). If this is realistic, then my personal experience of having six dogs (100%) experience a vaccine reaction is mathematically impossible. Mathematically it only requires a cluster of seven adverse reaction reports coming in during a narrow time frame for the claimed probability of 0.000005 to be rejected. Resulting from the combined data we can now estimate that the likelihood of a reaction to vaccination in a dog is at least 3%. This is about 30,000 times more risky than that accepted for human vaccines. In reality, we can be reasonably sure that the probability of a vaccine related illness is vastly under reported/admitted by manufacturers and authorities such as the Veterinary Medicines Directorate. It demonstrates clearly the need for a proper system of verification and compliance regarding the use of vaccines and other manufactured medicines. It is commonly believed that, as a dog gets older, the incidence of illness will increase. This has not been our personal experience, and the vaccine survey does not support this view, either. The data we have relates to dogs ranging from a few weeks old to over 19 years of age. The conclusion from this survey is that a dog can become ill at any age – there was no statistical bias between the incidence of illness and the ages of the dogs covered in the survey. The majority of respondents were UK residents (England, Scotland and Wales). The remaining respondents were from the USA, Canada, New Zealand and the Channel Islands. After analysing the two batches of combined data we can rule out environmental factors having any relevance to illnesses in dogs. A person who has kept dogs for many years is just as likely to experience illness in their dogs as a person who has had a dog for a short time, indicating that experienced husbandry has little bearing on the rate of illness (probably IF the owner is still vaccinating and feeding processed food). Based on combined survey data, we checked to see if it might be better to give annual boosters, or to give a puppy its initial course of vaccines and none thereafter. The risk of vaccine reaction appears to be the same irrespective of regime – initial only or annual vaccination. Nor are killed vaccines any safer than modified live vaccines. Based on the data gained after publication of the first edition of What Vets Don’t Tell You About Vaccines, we compared the profile of the second batch of data with the first. The objective was to ascertain whether or not we had received any different data that would invalidate previous conclusions. The second batch of data was a very close match to the first batch and statistically it can be concluded that the first and second batches of data are identical as to content. Consolidating the two batches of data together allowed some more detailed levels of investigation. Significantly, the rankings of different diseases and ailments following vaccination did not change materially compared with the previous analysis. In order of most significance, the following diseases occurred within three months of vaccination. Ataxia – 91% occurred within three months of vaccination. This can be caused by lesions throughout the central nervous system (Concise Oxford Veterinary Dictionary). The previous analysis showed that, with a 95% confidence, Ataxia was caused by vaccines. Additional data allows us to attribute a Chi score of 29 and, as stated previously, a Chi score of 13 gives a 99% confidence. On which basis, without any hesitation whatsoever, we say that the most common cause of Ataxia is vaccination. Nasal discharges – 87% occurred within three months of vaccination. Previous analysis was 84%. The Chi score is now 125. Loss of appetite – 83% occurred within three months of vaccination. Previous analysis was 79.8%. The Chi score is now 213. Tumour or growth at vaccine site – this has climbed from 67.9% to 81.1%. There is a Chi score of 62. Chorea – this has climbed from 63.2% and is now 81%. Chi score is 36. Vomiting – climbed from 72.5% and is now 79.7% with a Chi score of 190. Encephalitis (inflammation of the brain, with lesions throughout the brain and central nervous system) occurring within three months of vaccination has risen from 75% to 78.6%. The Chi score for this is 22. It’s interesting that this is a known and acknowledged vaccine reaction, and our survey shows well above a 99% certainty that it’s vaccine related – but some other diseases which are not acknowledge as vaccine reactions show even higher Chi scores. Diarrhoea – first interim results showed that 68% of the dogs in the survey with diarrhoea developed it within three months of vaccination. This has now risen to 78.4%. The Chi score is 290. Thus it is absolutely certain (not surprisingly) that vaccines can induce diarrhoea. Hepatitis – initially 63.6% and now risen to 75%. Chi score is 17, i.e., 99.5% confidence that hepatitis was caused by vaccines in the dogs in our survey. Short attention span – was 68.4% and now risen to 73.1%. The Chi score is 34. Again, this offers extremely strong proof (99.9% certainty) that dogs with short attention spans are vaccine damaged. Epilepsy/fits/convulsions – 65.5% of dogs in the first interim analysis developed epilepsy within three months of vaccination. This has now risen to 73.1%, with a Chi score of 96. We would say that the majority of dogs in our survey with epilepsy are vaccine damaged. Nervous, worrying disposition – this was the certainty in the previous survey, with 54.8% developing the condition within three months of vaccination, bringing a t score of 19.9. The percentage has now risen to 72.5% and a Chi score of 112. Yet another cast iron example of vaccine-induced brain damage. Weight loss – was 63.1% and has grown to 70.3% developing within three months of vaccination; with a Chi score of 101. Dry eye/conjunctivitis – was 56.9%, now risen to 70.2% with a Chi score of 95. Again, this is a vaccine-induced condition. Paralysis of rear end – was 64.7%, now risen to 69.2% with Chi score of 28. Parvovirus – in the previous analysis 68.2% of dogs with this disease developed it within three months of vaccination. This has now risen to 69%, giving a Chi score of 33. We were only able to say with a 95% confidence in the first analysis that parvovirus can be vaccine-induced. We are now able to say with a 99.9% certainty that it can (was). Lameness – was 52%, now 66.7% with a Chi score 66. Distemper – was 55.6%, now risen to 66.7%, with a Chi score of 12. Despite scientific research which shows that distemper can be vaccine induced, we can only give you a 95% confidence level of this fact. Colitis – was 54.8%, now 65.9% with a Chi score of 79. Obviously, colitis can be vaccine induced. Vets: please check your practice records. Behavioural problems – 55.4% of dogs in the first analysis developed behavioural problems within three months of vaccination. This has risen to 64.9% with a Chi score of 80. This gives a 99.9% certainty that the dogs with behavioural problems in our survey were brain damaged by vaccines. Liver damage/failure – the number of dogs in the survey with liver damage/failure within three months of vaccination rose from 47% to 61.5%, with a Chi score of 29. Previously, we were only able to offer a 90% confidence that liver damage and/or failure was vaccine-induced. It is now 99.9% certain that liver damage/failure is a vaccine-induced condition. Skin problems – 46.2% of dogs in the first analysis developed skin problems within three months of vaccination. This has risen to 61.2% of dogs, with a Chi of 130. A certainty at 99.99%. Autoimmune disease – was 54.8%, now risen to 55.8% with a Chi of 26. As it is acknowledged by Merck that vaccines can initiate autoimmune disease, all we can do is confirm the experts’ opinion. Parainfluenza – 50% of dogs with parainfluenza within the first analysis had been vaccinated against it within three months of getting it. This has now risen to 55.7% with a Chi score of 39. In the previous analysis we could only offer a 95% confidence that the parainfluenza vaccine could cause the disease. Now we are 99.9% certain. Pancreas problems – was 31.6% and is now 54.2%, with a Chi score of 13, i.e., a 99% confidence that vaccines can induce pancreas problems. Kidney damage – was 40.5% and has risen to 53.7%, with a Chi score of 20. Again, if you don’t want your dog to develop kidney damage, steer clear of vaccines. There were only small numbers of dogs with leukaemia, asthma and meningitis in the survey and although around 50% of the dogs with these diseases contracted them within three months of a vaccine event, because of the small numbers involved, we can only give low Chi scores. Heart condition – 26.8% of dogs with a heart condition first developed the condition within three months of vaccination. This has risen to 39.2% with a Chi score of 12, offering a 95% certainty that vaccines can induce this condition. Arthritis – the original analysis revealed that 71.8% of dogs with arthritis developed it within the third quarter after vaccination. Further data reveals that 37.8% got it within the first three months after vaccination, and only 21% in the third quarter. Our Chi score is still 13, giving a 99% confidence that arthritis in dogs in our survey is vaccine induced. It is interesting to note that the New England Journal of Medicine (vol 313, 1985), reported that it is often possible to isolate the rubella virus from affected joints in children vaccinated against rubella, many months after vaccination. The report tells of isolation of viruses from the peripheral blood of women with prolonged arthritis which followed vaccination. As, statistically, our survey indicates a strong vaccine-arthritis association, we feel that further research should be carried out. It could be that many viruses can stimulate arthritis and, particularly, the immune mechanisms following vaccination with a live virus vaccine. Cancer – 31% of dogs in the first analysis with cancer developed it within three months of vaccination. This has risen to 35.1%, with a Chi score of 15. This raises serious alarm. Indeed, we urge that those with the ability should look seriously at the vaccine link in relation to cancer. More research – looking at the onset of disease in relation to a vaccine event – could benefit animals and man. Genetic Pre-Disposition, or Vaccine Damage? Although I have never bred a dog, I have always intuitively doubted the assertion that most illnesses in dogs can be attributed to irresponsible or faulty breeding practices. We have sufficient data from a number of breeds to say that the genetic issue is a red herring without justification. We had sufficient data to look specifically at a number of breeds, and found that Golden Retrievers, German Shepherds, Shar-Peis, Border Collies, Boxers, and Cavalier King Charles Spaniels all showed a high incidence of illness in the first three months following vaccination. Mathematically speaking, the propensity to illness within these breeds is the same. The myth has told us that Border Collies, bred predominantly as workers, were hardier than other breeds, and that Shar-Peis hadn’t been westernised for long enough to suffer from irresponsible breeding. German Shepherds and Goldens, on the other hand, are said to be genetically compromised as they are so popular and therefore over-bred. Or maybe, on the other hand, all these breeds are genetically defective . . . . in which case, maybe all dogs are genetically defective and vaccination should not – as indicated by Merck – take place. These breeds all showed a marked propensity to illness in the first three months following vaccination and the clusters for the other quarters were very tight. Mathematically the profiles for each breed are the same. Dr Dodds has questioned why it is that big dogs and small dogs should have the same amount of vaccine. We have therefore checked to see whether illnesses are more common in small dogs than large dogs, or vice versa. We have found that size makes no difference, nor does it matter whether or not the vaccine used was killed, live, or a mix. Similarly, a puppy is just as prone to a vaccine reaction as an adult. Although illnesses can appear to clear up and then get worse upon re-vaccination, any vaccine, at any time, at any age, can invoke disease. And reactions can happen at any time of year. This highlights the false assumption that a puppy shot plus a booster is safe. It is not. Each time you vaccinate, you are relying upon luck. We can also now rule out geographical environment as having any bearing on the likelihood of vaccine reaction. Comparing data from England, Scotland, Wales and North America, a dog is just as likely to have a vaccine reaction irrespective of the country involved. The following published provisional conclusions have all satisfied mathematical or inferential statistical tests at a level of confidence of 99% or better. That is, we have rejected, unless otherwise stated, any result with a z alpha of less than 2.56. In mathematical terms, an alpha score of 4 would mean that the chance of a false conclusion is less than one in about 33,000. In many cases, the data we have is greatly in excess of 4, making the following conclusions a certainty for all practical purposes. The second analyses initially used the Chi square test. This test was used to compare the expected number of illnesses over the twelve months following vaccination against the actual results. We have rejected any illness with a Chi test statistic of less than twelve. That is to say, any Chi test statistic higher than twelve gives a 95% confidence about the conclusions. A Chi test result of 13 or greater gives a 99% confidence, and a Chi test of 17 gives 99.5% confidence. Only one test, heart conditions, was accepted at the 95% level as being vaccine-induced. Arthritis and pancreas problems are, at a 99% level of statistical certainty, vaccine-induced. Hepatitis is 99.5% certain to be vaccine-induced. Meningitis, CDRM, asthma, leukaemia and thyroid problems did not pass the statistical test, although the term ‘meningitis’ is often the name given to encephalitis. However, the numbers of dogs in the survey with such ailments were extremely small and as leukaemia is a form of cancer, if cancer and leukaemia are combined, then one can conclude that leukaemia, like other cancers, is vaccine related. Strong research does exist in the human field to link these illnesses with vaccination. We also know that thyroid disease is very commonly undetected in the dog and therefore undiagnosed, and diseases like leukaemia may have varying incubation periods depending upon the inherent health of the dog.